The South Dakota Pilots Association gives scholarships to high school students to participant in the Aerospace Career and Education (ACE) Camp held each July at South Dakota State University. Aerospace Career and Education Camp is held annually in mid-July on the campus of South Dakota State University in Brookings and is open to all students enrolled in grades 9-12 for the following school year. The SDPA provides scholarships to students from East River and West River to the ACE Camp. The SDPA has provided numerous scholarships to students in the past (recipients are listed below). 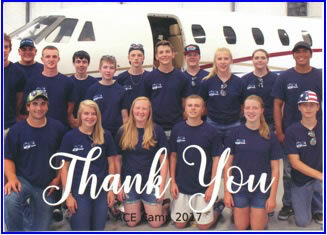 The Yankton Regional Aviation Association (YRAA) also provides scholarship assistance to students from southeastern South Dakota, west-central Iowa, or northeastern Nebraska to the ACE Camp. The YRAA has provided scholarships to students since 1992. Major ACE Camp sponsors are the South Dakota Space Grant Consortium, which is funded by NASA, and the SD Aeronautics Commission. 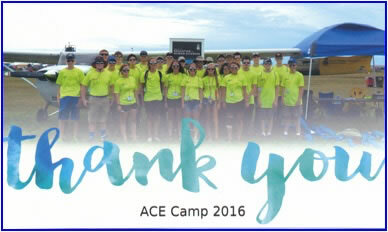 The annual ACE Camp provides an inside look at careers in aerospace, and at the education needed to pursue those careers. Activities include in-flight training, tours of SD Air National Guard, Lake Area Technical Institutes Aviation Maintenance Program, an air ambulance, star-gazing, and several other aviation/aeronautics related facilities. For more information or to apply please visit : http://www.sdstate.edu/consumer-sciences/ace-camp or contact the ACE Camp Coordinator at 605-688-4983 or email at cody.christensen@sdstate.edu. The application deadline is typically the end of June. Tuition includes room, meals, instructional materials, transportation during camp, in-flight training (weather permitting), a hot-air balloon ride (weather permitting), one evening’s entertainment, and a T-shirt. Tuition assistance is available, such as scholarships from the South Dakota Pilots Association and the Yankton Regional Aviation Association. Chad Edwards (Tea) & Jessica Goodart (Rapid City). 1996: Amanda Brandt (Brookings) & Steven Spanbauer (Iroquois). 1997: Darren Bryant (Centerville) & Brent Chapman (Hills, MN). 1998: Lee Huber (Emery) & Matthew Doerr (Mitchell). 1999: Andrew Schaunaman (Westport) & Ryan Siebrasse (Aberdeen). 2001: Leah Battin (Yankton) & Jesse Julius (Watertown). 2002: Nicole Siebrasse (Aberdeen) & Benjamin Zeeb (Lesterville). 2003: Andy Cahoy (Aberdeen) & Kris Schwartz (Dallas). 2004: John Bowman (Dakota Dunes) & Fielding Russell IV (Meckling). 2005: Emily Moncur (Miller) and Taylor Hagel (Rapid City). 2006: no scholarships due to paperwork problem at SDSU. 2007: Ryan Peterson (Hitchcock) and Sebastian Nabb (Kearney, NE). 2008: Nicole Schwebach (Egan) and Chase O'Farrell (Summitt). 2010: Samuel Hinricher (Dell Rapids) and Andrew Puetz (Brookings). 2011: Nathan Graham (Grundy Center, IA) and Leah Vander Vorst (Amherst, SD). 2012: Hannah Becker (Pierre), Cole Jorgensen (Hartford), Cody Hight (White River), Anna Maher (Fort Pierre). 2013: Gavin Munson (Pierre), Carter Venhuizen (Brookings), Trae Stenerson (Buffalo), Bramm Pickner (Sully Buttes). 2014: Cody Loup (Wilmot), Wyatt Rumrill (Pierre), Luke Schochenmeier (Pierre), Hannah Feten (Clear Lake). 2015: Samuel Sorrell (Box Elder), Neil Spieker (Clark), and Brittani Snow (Pierre). 2016: Dalton Lund (Hermosa), Nate Kettelman (Tea), Kristen Schmidt (Brookings), Luke Julian (Rapid City). 2017: Allison Blom (Huron), Nick Duncan (Brookings), Matthew Shad (Rapid City), Calvin Traversie (Eagle Butte). 2018: Sibi Manian (Brookings), Alexander Heinrich (Custer), Logan Sikkink (Castlewood), Brooklyn Harrison (Eagle Butte). 2019: East River and West River students. Group photo of ACE Camp 2016 at Sioux Falls Air Show. ACE Campers at the SD Air National Guard on the Sioux Falls Airport – Joe Foss Field -- 2015. 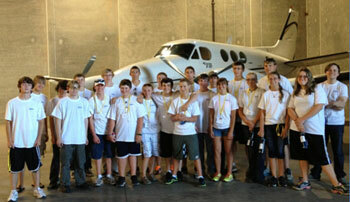 Group photo of ACE Camp 2013 participants at Landmark Aviation, Sioux Falls. 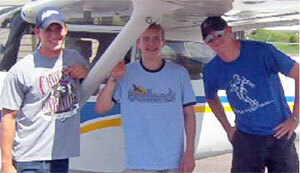 2004 ACE Camp students learned about aircraft at Big Sioux Aviation in Brookings. 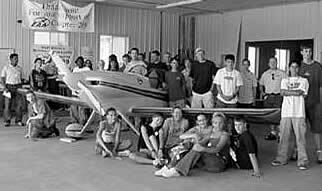 ACE Camp students at EAA Chapter 289 hangar in Tea to view experimental aircraft. 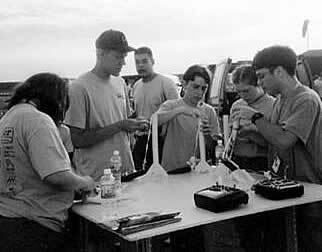 ACE Camp students building and launching rockets in 2002. 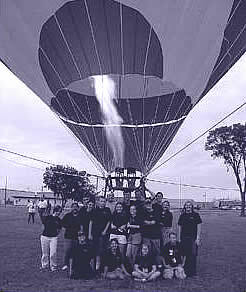 ACE Camp students at Aerostar International for hot air balloon demonstration in 2000. 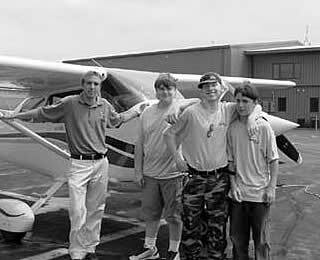 ACE Camp students pose before preflighting aircraft for flight in 2002.